The process of titration is used to calculate the concentration of a solution by neutralising it and doing some maths (all explained below). Measure 10cm3 of acid using a pipette for accuracy. Then release it into the conical flask. Put the conical flask on top of a white tile, this makes it easier to notice any colour change. Open the burette so the NaOH slowly flows/drops into the conical flask. Swirl the conical flask. Towards the end the solution turns pink but when swirled, returns to colourless. Now add the NaOH dropwise. Now turn off the burette as soon as the pink doesn't disappear. Record the amount of NaOH used. Repeat the experiment to get concordant (the same) results. The most important thing to know when doing this calculation is this triangle, all further calculations are based on this. 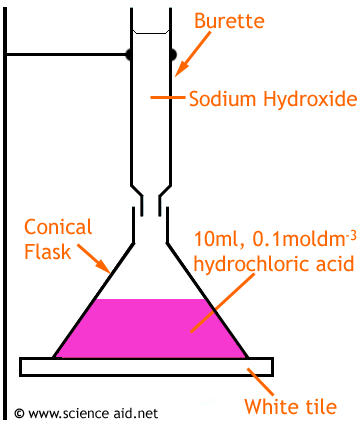 From the reaction, we can see that for every 1 hydrochloric acid there is one sodium hydroxide, so their moles are the same. 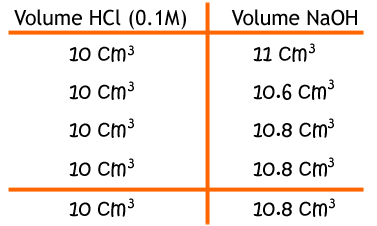 Given that we have the concentration and volume of HCl, we can work out the number of moles. It is divided by 0.01 since there are 1000 cm3 in 1 dm3. Now we have the moles of sodium hydroxide and also the volume we can work out the concentration.